LOCATION: Broadway Pizza Maple Grove is located at 7951 Elm Creek Boulevard North Maple Grove Minnesota 55369. You can visit their website at www.broadwaypizzamaplegrove.com. The telephone number is 763-416-4446. Wednesdays at 7:00 PM is BARGO night. Scotty T`s Team Trivia Blast and you can win up to $250.00 cash. 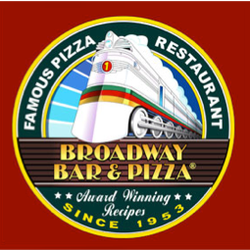 Broadway Pizza Maple Grove facilitates a Gluten free menu! All items on the menu can be gluten-free. The choice is yours. Baked Skinny Wings Tender chunks of white chicken breast baked to a golden brown. Your choice of plain or barbeque. Sweet Potato Waffle Fries Sweet potatoes made on a waffle iron! Tuscan Meatball Dip Homemade meatballs topped with garlic pesto bruschetta tomatoes, mozzarella and parmesan cheeses. Served with garlic pesto crostini. Broadway Poutine Crispy tots and cheese curds smothered with a smokey cheese gravy and then topped with jalapeno bacon, seasoned tomatoes and cheddar cheese. Onion Rings Thick onion cuts battered then fried until golden. Curd Town Curds Wisconsin cheese curds deeply fried and served with ranch or original broadway sauce. Crispy Pollock Fillet Deep fried and served with tartar sauce. Chicken Tenders Premium chicken tenderloins breaded and served with any sauce of your choice. Chipotle Nachos Crispy corn tortilla chips topped with jalapenos, black olives, tomatoes, and onions smothered with a blend of melted cheeses and a chipotle cheese sauce. Served with your choice of salsa or sour cream. Add grilled chicken, taco beef or steak. Baja Fish Tacos Made with crispy fried fish with a vinaigrette tossed with a mixture of lettuce. Plus black olives, onions, seasoned tomatoes, and avocados, wrapped in a flour tortilla with cheddar cheese. Plus a tangy chipotle ranch dressing. Broadway trios give you the option to choose three appetizers together. Italian Hoagie Filled with salami, ham and pepperoni, and topped with tomatoes, lettuce, onion, special sauce and melted mozzarella. Chicken Pesto Hoagie Made with baked chicken breasts and topped with tomatoes and onions and tossed in creamy pesto. Broadway Original This is the famous Hoagie at Broadway. Its made with sausage, pepper jack cheese, roasted peppers, and onion. Topped with original Broadway sauce. Served with banana pepper rings on the side. Meatball Hoagie Homemade meatballs with original Broadway sauce and loads of melted mozzarella. Hot Turkey Hoagie This has oven roasted turkey breast with tomatoes, lettuce, onion, special sauce, and melted mozzarella. Mama Mia Burger Made with pepperoni, melted, mozzarella cheese and original sauce. Then parmesan is sprinkled on top. Bruschetta Turkey Burger Mozerral is melted with fresh garlic pesto and bruschetta tomatoes. Chipotle Black Bean Burger Made with smokey black beans, pepper jack cheese, avocado, black olives and jalapeno and topped with creamy ranch dressing. Ghost Chilli Burger Spicy ghost chilli sauce on top of your patty of choice. With crispy bacon, gorgonzola cheese, avocado and ranch dressing. are served with fries or tater tot and a pickle. Taco Wrap Made with taco beef, roasted peppers, onions, ranch dressing, tomatoes, black olives, lettuce, mozzarella, provolone and cheddar cheeses. Sides include salsa and sour cream. Fresh Vegetable Wrap Fresh blend of avocados, red onion, olives, sun-dried tomatoes, spinach, spinach, cucumber, cheddar cheese and a creamy pesto ranch dressing. Buffalo Chicken Wrap Made with tomatoes, lettuce, onion, mozzarella, provolone, and cheddar cheese, and added blue cheese dressing. Your choice of grilled chicken or crispy chicken tenders tossed in buffalo sauce. Chicken Ceaser Wrap Made with bacon, tomatoes, and lettuce, tossed in a Caesar salad dressing. A mix of mozzarella, provolone and cheddar cheeses. Your choice of grilled chicken or chicken tenders. Sonora Chicken Wrap Made with smokey chipotle chicken, jalapeno bacon, onion, tomatoes, cheddar cheeses, and lettuce. Topped with chipotle ranch dressing. Pasta is served with garlic toast and a Broadway dinner salad. Mediterranean Spaghetti This is made with spaghetti noodles topped with a blend of seasoned greek olives. Also, sun-dried tomatoes, artichoke hearts, lightly tossed with extra virgin olive oil and parmesan cheese. You can add sweet Italian sausage or grilled chicken. Chicken Tortellini This is the chef`s signature dish, made with ricotta and parmesan on three colour pasta. In the mix is chunks of tender grilled chicken and vegetables and topped with alfredo sauce. Baked Lasagne This lasagna has fine pasta layered with a blend of blend of different cheeses, spices, ground beef and sausage. Steak Stroganoff A unique blend of fettuccine noodles, seasoned steak, and onions. Tossed in a spicy mushroom sauce and topped with fresh tomatoes. Pepperoni Packed Smothered in pepperoni plus extra added cheese. Exclusively for pepperoni lovers! Hawaiin Sizzler Premium Canadian bacon, pineapple, jalapeno bacon, mozzerrela and cheddar cheeses. Barbeque Chicken A tangy blend of Pizza and Barbeque sauces, chicken chunks, onion, mozzarella, and some cheddar cheese. Unique White Pizza Made with a specially seasoned chicken, parmesan, mozzarella and alfredo. Taco Made with spicy Taco beef, onion and black olives. Primo Made with sausages, pepperoni, and onion with extra cheese. Eddie`s Extra Special Made with shrimp, plus cheese, sausage, pepperoni, mushrooms, green pepper and onions. Meat At Broadway Packed with homemade sausages, crisp bacon, ham, pepperoni. Specially made for all meat lovers. Broadway cater`s for the sweet tooth! SUNDAE Sundae is made with vanilla ice cream and topped with chocolate, strawberry, or butterscotch topping. Then to top it off, whipped cream and a cherry. VANILLA RASBERRY CAKE Yellow sponge cake made with raspberry vanilla cream, strawberries and sweet icing. DEEP DISH COOKIES A rather large chocolate chip cookie topped with vanilla ice cream, whipped cream, chocolate syrup, and a cherry on top. OLD FASHION MALT You can choose between vanilla, strawberry, chocolate, and butterscotch. 1919 ROOT BEER FLOAT A refreshing frosty mug of Minnesota`s made 1919 root beer served with vanilla ice cream. Make is Broadway everyday for all your catering and dining needs!